The publication puts a spotlight on plant health issues in sub-Saharan Africa which are key to improving yields and summarizes 50 years of research on plant health by IITA to improve the health of crops in the continent. The book also reviews ways of improving the health of key African crops such as cassava, maize, and grain legumes, and brings together leading experts on plant health in sub-Saharan Africa to review progress in dealing with the range of biotic threats faced by African farmers. 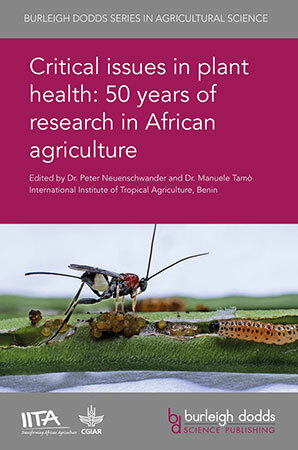 The book is edited by Benin-based IITA Emeritus Scientist Peter Neuenschwander, who is also the former Director of IITA’s Plant Health Management Division, and Manuele Tamò, Insect Ecologist and IITA-Benin Country Representative. Several scientists and researchers from IITA and partner organizations have contributed to the book’s contents. The book has four parts, namely: Managing threats to plant health; Plant health in practice: Managing threats to key African crops; Integrated pest management: Putting it all together and exchange of knowledge with farmers; and Conclusions and future challenges. It aims to be a standard reference on improving the management of pests and diseases in developing countries.